It's a common misconception that tiles are just for bathrooms and kitchens, but they are extremely versatile and can really add some originality to your home. You can incorporate tiles into every room of the house, and these following tips will show you how. Having a tiled floor in your bedroom may seem bizarre, but using natural materials and large format tiles they can really update your room and add a modern touch. This year, it's all about the natural finish. Opting for stone, wood or marble effect tiles will provide the perfect base for your room. From here you can accessorise in pretty much any way you'd like. Earthy features such as wooden furniture can enhance this back to basics look. However, as it is such a clean slate to work with, you can fill your room with colour and make it bold and still retain the beauty of the tiles. Not to mention they're easy to clean, functional and fashionable. Your kitchen seems like an obvious place to have tiles, whether it is as your sinks splash back or as your flooring. But it's how you use the tiles that can completely transform your room. Tiles can be adapted whether you have a country kitchen or a modern and contemporary one. Slate and natural stone tiles for the flooring can be used in both new and old kitchens. They're functional for spillages and cleaning, as well as adding elegance to the kitchen. When using tiles on the walls, you don't have to opt for one standard and basic tile all the way around. For an up-to-date twist you can mix and match your tiles to make a statement feature. Great ways to do this are to choose a colour scheme and base your tiles around it. If you like more colours in your kitchen, adding mosaic or patterned tiles to a feature wall and splash back can really make it fun and stylish. Adding large format tiles to your living room will guarantee a flawless and luxurious finish. Going back to natural materials such as granite or marble is a gorgeous way to add sophistication and to your room. They are a timeless way to update your room, natural materials and colouring never goes out of style, so you can play around with colours on your walls, furniture and accessories. Large format tiles will create the illusion of a larger room, using a grout the same colour as the tiles will create a flawless and fluid finish. For an alternative look you could even mount these tiles to the wall, for example this may work as a fireplace surround. Your bathroom is probably the easiest room of the house to add tiles too, but this doesn't mean they have to be boring and clinical. A bathroom has so much potential to be fun and the one room you can afford to go a bit eccentric with. Adding coloured and patterned tiles to create feature is a great way to transform any bathroom. This year the popular bathroom colours have been matte neutrals such as pastel pinks and blues paired with grey to introduce some contrast into the room. Keeping up the neutral theme, but adding interesting and intricate designs is what makes this bathroom tiling tip one to bear in mind if you're renovating! Finally, it's the hallway. This may seem like the last place you would want tiles, but they are guaranteed to make a statement upon entering the house. Believe it or not they can be used for walls as well as floors. A large natural tile such as marble on the floor can make the room look larger as well as luxurious. This gives a solid base so that you can choose wallpaper or paint to suit your tastes. 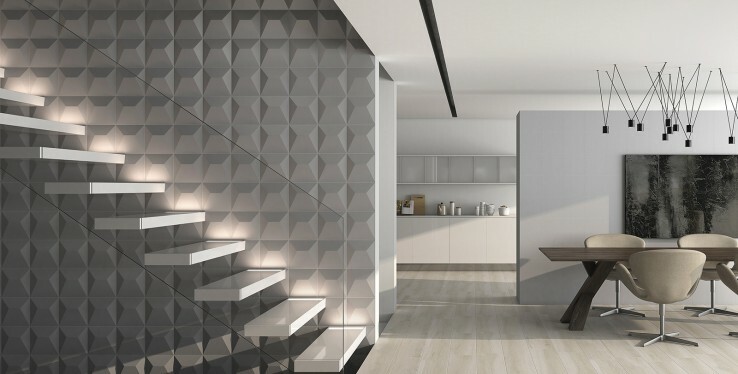 Textured tiles on walls will create a modern and almost futuristic look. If this isn't for you, tiling your staircase can also give a new twist to the room. There are endless ways to use tiles in your hallway, if you're unsure how to incorporate them into your home you can speak to one of our specialists. Whether you're after a natural finish or want to go bold with colour, Real Stone and Tile are guaranteed to have something for you. Dont' forget, our experts are on hand in our Cheadle showroom to help you create your dream home.